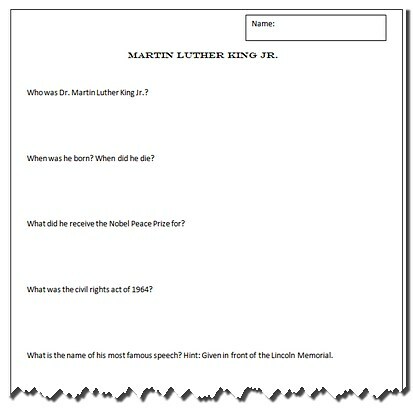 A Collection of Actvities and Lesson Plans for Martin Luther King Jr. 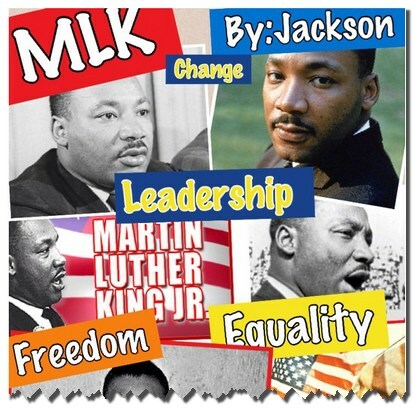 This is a collection of a variety of technology integrated activities for Martin Luther King Jr. There are activities for writing, research, and presentations. The "Words of Freedom" collage and "Puppet Show" are for use with iPads. The "Words of Freedom" activity uses the FREE ipad "Pic Collage" and the printed results are excellent for bulletin board displays. 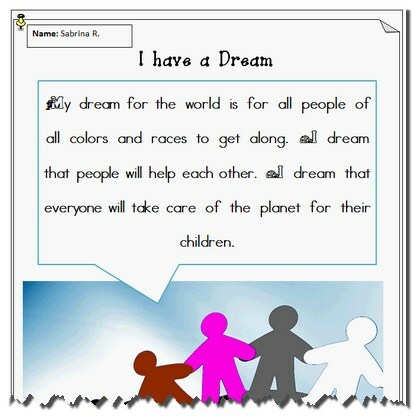 The "I Have a Dream" Poem Generator is a quick and easy activity that allows students to create a personal poem about their own dreams. 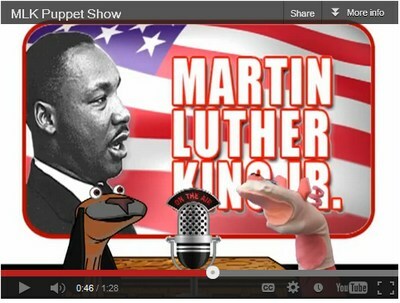 There are also some kid friendly Martin Luther King Jr. website links for research use. Students think about ways to make the world a better place. Students write their ideas inside the speech bubble template describing their dreams to improve the world. 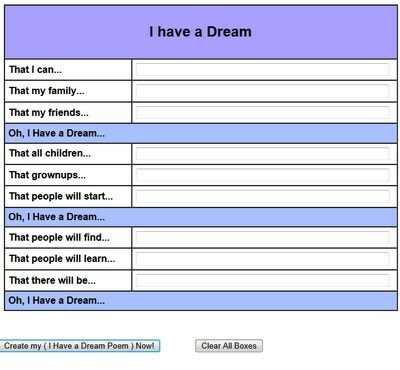 Students create their own "I Have a Dream" poem by filling in text boxes in the poem generator. Students copy and paste the generated poem into a word processor, add clipart or images and their name. 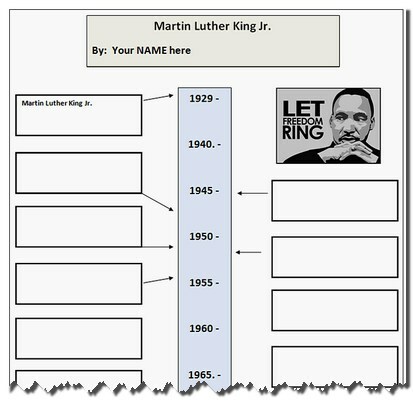 Students research information about Martin Luther King Jr. and use the timeline template to create a timeline of Dr. Kings life. Students create a PowerPoint style presentation. Applicable to Microsoft PowerPoint, Apple Keynote, Google Presentations and Open Office Impress. 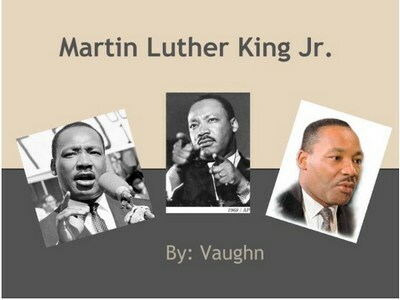 Students research and create a presentation about Dr. King's early life, important achievements and other interesting facts. Students combine brief research with images to create an iPad story collage about Dr. Martin Luther King Jr.
Students collaborate to create an informative puppet show about Dr. Martin Luther King Jr.
National Geographic Kids - Dr. Martin Luther King Jr.
Social Studies for Kids - Martin Luther King Jr.
Enchanted Learning - Martin Luther King Jr.
BrainPOP - Martin Luther King Jr.